Fairies are an elusive bunch, often sequestering themselves away, hidden from prying mortal eyes. But our fairy collection is a sanctuary for fairies, pixies, and all other fae creatures. And they are featured in quite a variety of forms to suit virtually any of your needs. For the fairy fanatic or enthusiast, there is no better place to be then right here, as we carry a wide assortment of different fairy collectibles. 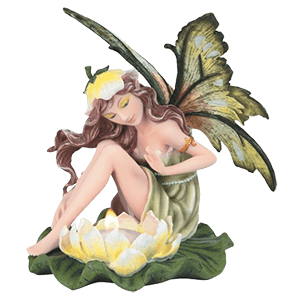 Our selection of fairy statues just cannot be beat, as we offer a massive variety of different fairies, ranging from woodland fairies, to gothic fairies, to shy fairies, to brave fairies, and more. Our fairies dance, sing, play, nurture, and rest, all as they hold their position as a fairy statue or a fairy figurine to display in your own home or collection. Given that some are designed by famous fantasy artists like Sheila Wolk, Josephine Wall, Jessica Galbreth, and more, you can bet that these fairy accents are always stylish and breathtaking. 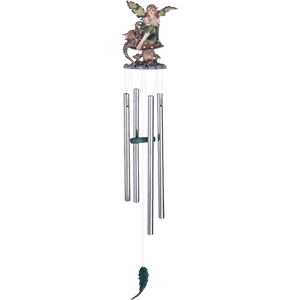 Of course, we also offer a number of other fairy decorations, ranging from fairy pillows to rest on and fairy tables for displaying and holding things, down even to fairy wind chimes, which are perfect for emulating the sweet music of the fairy! If you are looking for a way to keep a fairy in your heart and your life, every day of the week, then you have come to the right place. Whether you want to wear fairy t-shirts to show off your fantasy style or just display a diverse array of fairy decorations, like wall scrolls and candle holders, you will find all of that and more here. Take a journey into our safe haven for fairies, and you will not be disappointed in the immense variety that awaits. We offer such a wide selection of different fairy statues and fairy figurines here that you might think you have wandered into a realm inhabited by fairies and fae creatures of all sorts! Our fairy statues section is home to a broad array of different fairies and their companions, which ensures that there is a fairy here for everyone! If you thought that fairies were docile and timid little creatures, think again! These fairy statues and fantasy figurines love to be in the lime-light, which means that each and every one is worthy of display. Our fairies come in a wide variety of styles, ranging from fearsome fairy warriors to peaceful fairy maidens. Some of our fairy statues enjoy the scents of flowers, while others enjoy the company of various creatures ranging from dragons and unicorns to woodland animals like owls, bears, and wolves. They also come in a wide variety of sizes, ranging from small statues that will go on virtually any shelf to large statues that make fantastic centerpieces in homes, collections, or gardens! And our fairy statues come in so many different colors that it would be impossible to name them all here. Do not just take our word for it, though. Take some time to browse through our fairy statues, and you are bound to find a fairy figure or sculpture that suits your style. If you find yourself bogged down and burdened as you go about your day, then we have the solution just for you, especially if you consider yourself a connoisseur of fine fairy art. We offer a number of various fairy bags that are perfect for carrying things and also offer a touch of attractive fairy style. Are you looking for something stylish to carry throughout your day to day activities? If you want something that is distinctive and personal yet small and convenient, then you are looking for a fairy shoulder bag or fairy purse. 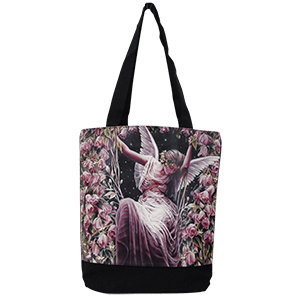 If you require something with a little more storage, something that will serve you well when you are carting around books, a laptop, or other large items, then you might want to try one of our fairy tote bags, or perhaps even our fairy messenger bags. But no matter which style of bag you choose, you can rest assured that you are going to get a great one, because all of our fairy bags feature the artwork of skilled fairy and fantasy artists, including the likes of Linda Ravenscroft, Sheila Wolk, Jasmine Becket Griffith, and more! Not only are they great for carrying stuff around, but these fantasy art bags also bring a huge touch of fantasy to your personal style, one that will attract and hold the attention of others when they see it! These fairy bags are great for personalizing your everyday look with an accessory bag that suits your tastes. All you really have to do is decide which kind of bag you need and which design most appeals to you! Fire is far from a purely destructive element, as it possesses many positive, redeeming qualities, too. Our fairy candleholders are the perfect way to bring out the best in a flickering flame, as they accent the luminous glow of a candle with the beauty of a pretty little pixie. After all, as spirits of nature, it seems right that fairies would be the most familiar with some of the best qualities of fire. These fairy candleholders depict a wide assortment of different fairies, ranging from the typically playful to the calm and somber. Some fairies sit before the candle you place, while others seem to dance with the flame. These candle holders are perfect for holding a variety of different candles, too, as many are sized to fit small votive candles or tea lights with ease. And just as the fairy enjoys the soft flickering of a flame, so too can you, as these fairy candle holders come in all different shapes and sizes, ensuring that no matter where you want it to go, there is a fairy candleholder that will fit your needs in both its design and size. The benefits of these fairy candle holders are obvious, as each one depicts a beautiful little fairy that will catch the eye of all who glance its way, while the addition of a flickering light will only accent the beauty of the piece. If you are looking for a way to incorporate a bit more light and a bit more fantasy in your life, then our fairy candleholders are the way to go. Some stories say that time passes differently in the world of fairies. But our fairy clocks are ready to help you keep track of the time in this human realm! Utterly lovely to behold and functional, too, our fairy clocks are all gorgeous examples of fantasy at its finest. 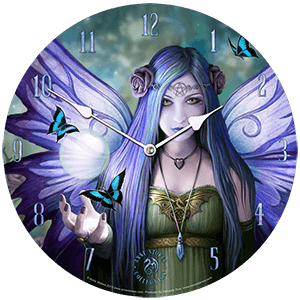 Here we offer fairy wall clocks featuring the work of famous artists like Anne Stokes, Sheila Wolk, and Lisa Parker. Our analog fairy clocks are great decor pieces to place on any wall in your home. We also carry a selection of gothic fairy clocks that add the decadence of darkness to the appeal of fairy fantasy. This category holds all our fairy clock decor, including fairy desk clocks, fairy table clocks, and fairy statue clocks, as they become available. 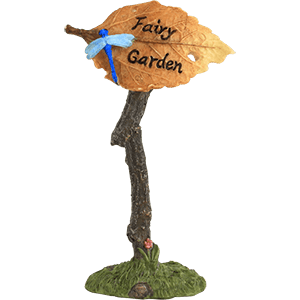 Welcome denizens of the fairy realm into your own environment with our fairy garden buildings and accessories. Here you will find everything you need to create your own miniature fairy village. Check out fairy garden homes and fairy doors for placing on trees. Then shop fairy furniture like picnic tables and benches alongside other fairy garden scenery items like fairy swings, fairy wishing wells, and even decorative moss and tree trunks to form the base of your outdoor fairy display. Create a home for fairies and gnomes alike with our miniature fairy garden buildings made to look like everything from rustic cottages to gourd-shaped inns. And do not forget to populate your fairy garden with our miniature fairy figurines and fairy figure sets! Like crystal balls used to peer deep into the future, our fairy globes and fairy crystal balls are sure to capture the attention of all who behold them. 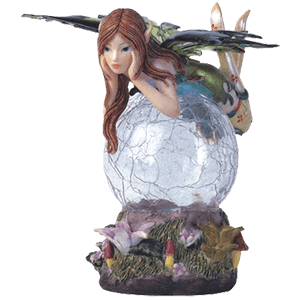 We offer a variety of fairy snow globes, fairy water globes, and fairy crystal ball statues in this category, all with captivating detail and imaginative depictions of both classic and gothic fairies of fantasy. 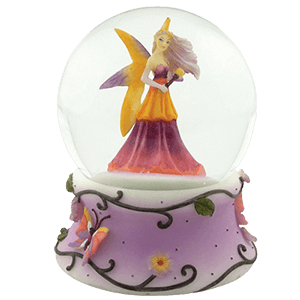 Our fairy crystal balls largely feature a crystal ball base that stands out among any decor or collection with a cast resin fairy figure situated on top of the orb. Our fairy globes feature similar orb aspects, albeit filled with glitter that, when shaken, presents a magical display. No matter the type of fairy you love, check out our variety of fairy globes and crystal balls to find a fantasy home accent that will perfectly reveal your style or add just the right touch to your decor. Within our fairy home decor and gifts category, you will find everything you need to transform your home into a fairy palace. 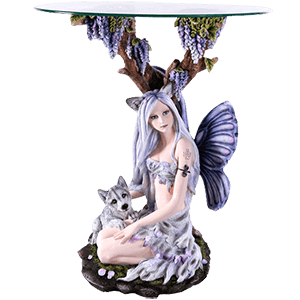 Here we offer all sorts of fantasy home accents with fairies as their inspiration, including fairy tables, fairy fountains, fairy drinkware, fairy tiles, fairy banners, and much, much more. 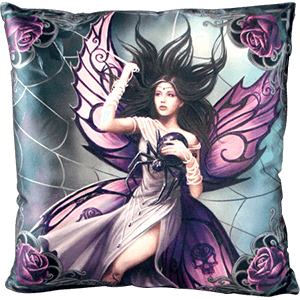 Some of our fairy home decor pieces feature the gorgeous artwork of acclaimed fantasy artists like Anne Stokes as signs or wall scrolls. 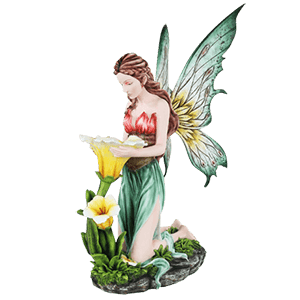 Other fairy home accents, such as our fairy tables and fountains, have impressive statue bases that have been painted by hand to highlight each detail. Whether your home needs just a touch of fairy style or you are looking to deck out your entire space in the beauty of the fairy realm, our fairy home decor items are ideal for doing both. Fairies are peaceful creatures by nature, and there is nothing that a fairy likes more than to sit and relax. And there is no better way to relax after a hard day then to sit back and enjoy a stick of your favorite incense. 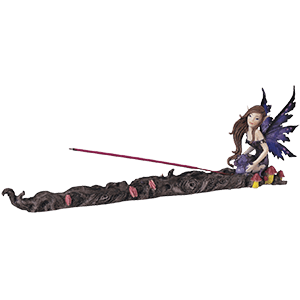 With our fairy incense burners, you can do just that while combining two of your favorite things, fairies and incense. Many of our fairy incense burners are perfect for enjoying your favorite incense in stick form, possessing a holder and an ash-catcher that makes enjoying incense simple and easy with very little fuss or clean-up. They come in all different forms, depicting a variety of colorful fairies as they pause in their activities, either to admire nature or to enjoy the smell of incense as it is burned. And even better, given their fairy fantasy designs, these fairy decorations are great to leave set out as permanent parts of your decor, as they all have the looks and detailing of a fairy statue paired with the convenience of an incense burner built right in. 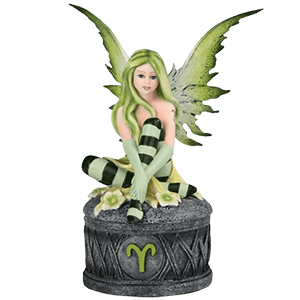 So if you are looking for a small fairy display to put up in your home, or if you just want a good incense burner that involves one of your favorite elements of fantasy, then look no further than our fairy incense burners here. A personalized notebook is a great way to make your work stand out. If you are personally interested in the works of fantasy that feature fairies and fae creatures of the forest realms, then perhaps one of these fairy notebooks and journals would be the notebook for you. Our fairy notebooks and journals are great for a wide variety of uses, not the least of which being as stunning decoration. Each and every notebook features a fairy design in some way, making it a work of art in its own right. Our fairy notebooks would be especially useful to artists and writers, who typically go through whole notebooks with remarkable ease, filling them with works, notes, and ideas to be used and perfected at later dates. Even casual writers or students can make use of these notebooks, as they are perfect for taking notes and jotting down ideas. And of course, as the title of the category implies, each and every fairy notebook featured here makes for a great journal or diary, containing your private thoughts safely under the guard of a fairy from fantasy. 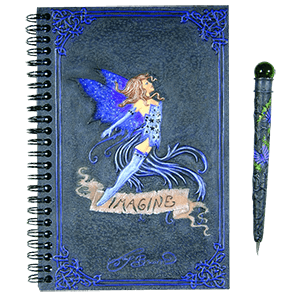 Essentially, if you like to write or draw, and if you have an interest in the fantasy world of fairies, then one of our fairy notebooks and journals is likely to be a great thing for you have and fill with words, sketches, thoughts, and ideas. You do not have go to the forest realms to see fairies fluttering around. 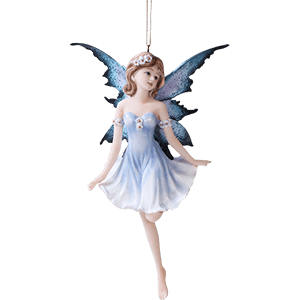 Here we offer a magnificent selection of beautiful little fairy ornaments that you can hang up around your chosen space to make it seem like real fairies are flying about within your home or office! These decorative fairy ornaments are quite the sight to behold, possessing small, convenient sizes as well as great levels of detail that make each one all the more impressive. As is typical of fairies, many feature stunning and bright colors, although some are a bit more subtle in their style, meaning that there is a fairy ornament here for virtually anyone. Typically, ornaments are reserved for the Christmas tree, and these little fairies go great when hung off the bows of any tree that is brought in for the holidays, whether real or simulated. They are not just Christmastime decorations, though, as these fairy ornaments look great when celebrated year round, ensuring that no matter what time of the year it is, you can show off your love of fairies with ease! Our fairy trinket boxes are perfect for keeping your smallest keepsakes from looking cluttered. Stylishly store your jewelry, coins, and other tiny treasures in these fairy trinket boxes. True to their names, these fantasy trinket boxes each feature an impressive style that depicts a fairy in some way, either showing impressive fantasy art on the box sides and lids or featuring the detail of a fairy statue. Truthfully, you do not even really need to have a clutter of small things to store, as these little fairy trinket boxes are great display items to have decorating your room regardless. So if you have some little odds and ends floating around your living space and you want to store them properly, you might want to consider one of our fairy trinket boxes. Wearing one of our fine fairy t-shirts is a great way to show off your love of fantasy, especially if you are particularly enamored with the fine world of fairies. Offering a superb selection of both colors and styles, these fairy t-shirts are perfect for the fairy enthusiast who wants something that they can wear any day of the week. Some of our fairy t-shirts depict woodland and flower fairies in their natural state as they happily enjoy nature to its fullest. The styles of our fairy t-shirts are quite varied, though, and others depict fairies in a variety of other situations and scenes. This means that if you want a t-shirt that features a quiet, contemplative fairy, you can find that here, and if you want a shirt that features a beautiful gothic fairy, well, you can find that here, too. 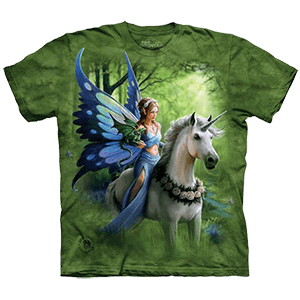 Many of our fairy t-shirts are made from quality cotton fabric, and given that many feature designs based on the artwork of famous fantasy artists, including artists such as Amy Brown, Linda Bergkvist, Josephine Wall, Julie Fain, and more, it is not surprising, really, that they feature such a diverse array of styles and designs. And like a good t-shirt should be, each and every one is extremely comfortable to wear, which means that you will want to wear them on a daily basis! We have fairy t-shirts for both adults and children here, as well as fairy graphic t-shirts with a more feminine cut, so why not stop in and browse through them when searching for the next piece of your fantasy wardrobe?